This Gallon Clear has the same excellent resistance to chemicals, abrasion, heat, and impact that our Floor Armor Coating has. It also permanently seals in our beautiful decorative chips. 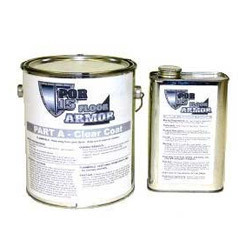 Easily outperforms epoxies in durability and adhesion. We recommend POR-15 No-Slip Aggregate (standard in every kit) to avoid slipping when floor is wet. Gallon Clear has long pot life and easy to use. Warning: This product contains ethylbenzene - A Chemical known to the state of California to cause cancer.